Learn about ranks, rewards, and the currencies of Battlefield V.
With Battlefield™ V, we want to take you on an expanding journey through World War 2, where every Chapter brings a new battlefield. This journey starts at launch and then continues into Tides of War, which will deliver additional maps, modes, gear, and gameplay. Because we want every Battlefield player to join us on this journey, Battlefield V has no Premium Pass. As you experience Tides of War — or play through any multiplayer mode — you will be able to personalize and progress a custom arsenal of weapons, vehicles, and soldiers. This collection becomes your Company. The Company is the heart of your Battlefield V journey, and it's all-new to the Battlefield series. In this article, we'll explain the Company's progression system and the game's economy. Below are the important things to remember. In Battlefield V, you progress by playing. The more you play, the more you'll progress, and the more items you can unlock to outfit your Company. When it comes to gear, there is no one right answer — only what's right for you, your playstyle, and the needs of your squad. There are two types of in-game currency. 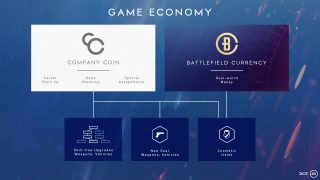 Company Coin is earned only through gameplay. Battlefield Currency is purchased with real-world money. Battlefield V is made to reward how often you play and how well you play. You will never be able to use Battlefield Currency or spend real-world money to get anything that gives you an unfair gameplay advantage. As you play, your progress will unlock new items to outfit your Company. A fine-tuned Company gives you more options when you squad up with other players — more ways to adapt, overcome, and win on the battlefield. Your time spent playing Battlefield V is represented by ranks in five categories: Career, Class, Weapon, Vehicle, and Chapter. Increasing your rank in each category rewards you with both gameplay items and cosmetic items. Gameplay items include weapons, vehicles, and weapon parts. Cosmetic items include weapon skins and soldier gear that change the look of your soldier. This is your overall rank that increases with nearly everything you do in Battlefield V. Career Rank is represented by the familiar military rank structure (such as Private, Sergeant, Captain, and others), and increases with whatever game mode, weapon, or class you choose to play. As you gain Career Rank, you'll earn Company Coin and unlock vehicles to add to your Company. This rank reflects how often you play as one of the four classes in Battlefield V: Medic, Recon, Assault, and Support. Progression in this rank unlocks Combat Roles — as well as additional primary weapons, side arms, melee weapons, gadgets, and grenades within a class. Both primary weapons and vehicles have a progression system all to themselves. Earn XP while using a weapon or vehicle in battle and you can then choose to spend Company Coin to unlock choices within their Specializations. Each Specialization path changes how a weapon or vehicle plays, so you can modify it to fit your style. For example, you could choose to improve the hip fire accuracy of an MG 42 machine gun, or increase the durability of a Valentine tank. Earlier this year, we introduced Tides of War, an expanding journey for all players through mankind's greatest conflict. Each Chapter in Tides of War brings a new battlefield that takes you and your Company into fresh gameplay experiences, including maps, modes, weapons, vehicles, cosmetics, and themed rewards. You gain Chapter Ranks by playing any game mode during the course of a Chapter, with extra bonuses for completing Tides of War missions. The more you play during the Chapter, the more Chapter rewards you’ll unlock. We'll explain this in more detail as we get closer to our first Chapter, which arrives soon after launch. As you play and progress through Battlefield V, you will earn Company Coin. Company Coin gives you the ability to choose items outside the base progression paths to further expand and customize your Company. You can use Company Coin to unlock choices within weapon and vehicle Specializations. You can also use Company Coin to get cosmetic items, such as jackets, face paint, and weapon skins. At launch, cosmetic items will be available for soldiers and weapons. 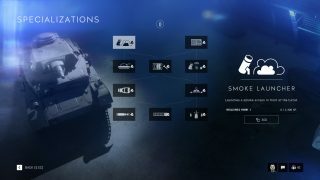 Vehicle cosmetics will be available in the first chapter of Tides of War. 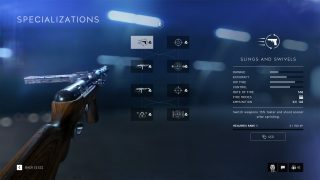 Battlefield V will also have an optional currency known as Battlefield Currency, which is purchased with real-world money. Battlefield Currency can be used to acquire specific cosmetic items for your Company. Balanced rock-paper-scissors gameplay has always been the foundation of the Battlefield series, and our belief is that real-world money should not enable pay-to-win or pay-for-power. When it comes to gear, there is never a correct choice. There is only the choice that's right for you. It's up to you to decide what types of gameplay matter to you and make inventory decisions based on how you want to progress. Experiment with weapons and vehicles that bring unique options to the battlefield, cosmetics that reflect a more personal touch, or Specialization paths that fit your style of play. Our vision at DICE is to continuously bring you new ways to play by evolving and expanding the battlefield. As that journey unfolds, the progression system and game economy are designed to give you interesting choices. Soldiers, weapons, and vehicles that look and play the way you want — and give you and your squad more ways to triumph through balanced rock-paper-scissors gameplay. We can't wait for launch; it's just the beginning of our journey. We'll see you on the battlefield. The goal of fair and balanced play without pay-to-win is always front and center of everything we do for Battlefield V. However, please note that game content, gameplay mechanics, and other Battlefield V aspects covered in this article may change between now and the launch of the game.